This is the third part of a list of songs in the Searching For A Gem pages. Titles in red are not included on a currently available Columbia Bob Dylan CD (for these see bobdylan.com ). Dates are of first release. R-0719 Live with the Hawks, Odeon Theatre, Newcastle, 21 May 1966 from the 1967 unreleased documentary "Eat The Document", see VHS & DVD 1960s, and from the Martin Scorsese documentary film Bob Dylan: No Direction Home - A Film by Martin Scorsese, DVD release, Sep 2005, see VHS & DVD 2000s Part 3, now also on the Columbia/Legacy USA/Europe 36CD set The 1966 Live Recordings, Nov 2016 (where it's wrongly attributed to Cardiff, 11 May 1966!) 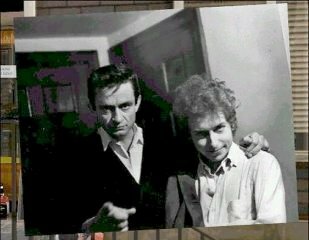 The attribution in 2005 on Bob Dylan: No Direction Home - A Film by Martin Scorsese is correct! (The performance on 1970's Self Portrait is edited, as is the version on the 2013 remastered Self Portrait, CD4 of the Deluxe Edition of The Bootleg Series, Vol. 10 - Another Self Portrait, also included in 2013's The Complete Album Collection, Volume One). R-0442 As Come Una Pietra Scalciata (Dylan/Aleotti/Perrini) - cover version in Italian by Articolo 31 from their album Nessuno with parts of Bob's original version included, see 1998. This track is also available on the May 2001 BMG Germany compilation May Your Song Always Be Sung Again: The Songs Of Bob Dylan Vol. 2, see 2001. R-0266 With Ralph Stanley, from his Rebel Records album Clinch Mountain Country, see 1998. The Lonesome River was released in Oct 2008 on CD2 of The Bootleg Series Vol. 8 - Tell Tale Signs: Rare And Unreleased 1989-2006, see here. This means R-0266 has ceased to be a rarity. This is the only recorded performance of this song by Bob, the performance on the 1975 double album The Basement Tapes is by The Band with vocals by Rick Danko. The song was performed live by Bob on other occasions in late 1965, but this is the only known recording. Thanks to Bob Stacy who writes: "In the "Chicago Tribune", 27 Nov 65 (the day following the show at Aire Crown Theater, 26 Nov 65), the reviewer Bruce Plowman noted, "Dylan introduced a new song last night, one which he wrote, called 'Long Distance Operator'." Also, Bob says someone who attended the show at San José, CA, 12 Dec 1965, remembers hearing the song. No studio version is known. R-0297 Live, The Oval, City Hall, Sheffield, England, 30 Apr 1965 (misdated as from City Hall, Newcastle, England, 6 May 1965 (incorrectly shown as 9 May 1965), from the DVD release of D.A. Pennebaker's 1965 film "Don't Look Back", see VHS & DVD 2000s Part 1. The performance has now been positively identified as actually being from Sheffield! This entry has now been moved to "Red Herrings"! R-0862 Live, recorded Brandeis University, Waltham, MA, 10 May 1963, from Bob Dylan In Concert: Brandeis University 1963, bonus disc with 8CD boxed set The Original Mono Recordings, Columbia/Legacy (USA/Europe), 2010, removed now this album has been added to the bobdylan.com albums page. Released take, Take 1 - with band (5:43 edited down to 4:19) was recorded at A&R Studios, New York, 16 Sep 1974. Take 1, Remake – with band (4:57 edited down to 4:17), recorded at A&R Studios, New York, 17 Sep 1974, was released on the single CD version of The Bootleg Series Vol. 14 - More Blood, More Tracks, 2018, This means the full 5:43 and 5:57 versions remain rarities! This is the version included on the Blood on the Tracks test pressing and previously released on Blood on the Tracks, but in edited form (4:19), so R-1933 is a rarity! R-0935 Take 1, Remake - out-take from the Blood On The Tracks sessions, 1974, B-side of Record Store Day Duquesne Whistle Columbia US 7" stereo single, Nov 2012. R-0935 is still a rarity after being released on the single CD release of The Bootleg Series Vol. 14 - More Blood, More Tracks, 2018, because the version on that CD has been edited by around 40 seconds! R-0001 Bob plays harmonica for Harry Belafonte on the title track of his 1962 RCA album The Midnight Special (stereo version), see 1962. The track has also appeared on many Harry Belafonte compilation albums from 1972 to 2007, and several Various Artists compilations up to 2014, see the chronological pages of the Rarities listing. *Note on authorship: Michael Krogsgaard reports the studio records as listing this song as "Milk Cow Calf's Blues" by Robert Johnson. Michael Gray in "Song & Dance Man III" (Cassell, 1999) says: "When Dylan recorded "Milk Cow Blues" (unreleased) in 1962, he used part of Kokomo Arnold's lyric, part of Presley's, part of Robert Johnson's 1937 "Milk Cow's Calf's Blues" and part of Lead Belly's "Good Morning Blues", shuffling the elements around in the course of two takes." (Gray says earlier that although Elvis Presley's Sun version ("Milkcow Blues Boogie") is credited to Kokomo Arnold, it is completely different from Arnold's song, and seems actually to be the version of "Milk Cow Blues" recorded by Johnny Lee Wills in 1941.) According to Krogsgaard there were actually four takes on 25 Apr 1962, take 1 did not come into circulation until 2012 on the Sony Music Europe 4CD set The 50th Anniversary Collection (see 2012), take 2 was incomplete, and the takes which surfaced in 1980 referred to by Gray were takes 3 and 4. For details of all the alternate takes of this song, see 1962, 1974, 1976, 1978, 1982, 1984, 1985, 1997 and the Sony Music Europe 4CD set The 50th Anniversary Collection, 2012. Many thanks to Roger Ford, Les Kokay, Bob Stacy and Ian Woodward for all their information about these alternate takes, and for permission to reproduce their findings. R-0748 A stereo mix of the same overdub take as R-0145, with the overdubbed backing more clearly audible, but faded out a few seconds earlier and similarly slowed down. This appeared on the original 1985 release of Biograph (see 1985), disappeared in 1997 when the album was remastered, but has recently resurfaced on a European “ecolbook” edition of the album - see the Biograph page of International Albums (Regular). Thanks to Blake Eikenberry for information that 2013's Side Tracks, released as a 2CD set as part of The Complete Album Collection Vol. One and also as a limited numbered edition 3LP set, also contains the alternate take of Mixed Up Confusion from the 1985 release of Biograph (R-0748)! See International Album Releases (Regular) - 2010s Multi-Packs and International Album Releases (Dylan-Only Compilations) 2010s. R-0573 Second alternate take to the original single, out-take from The Freewheelin' Bob Dylan, recorded at Columbia Studios, New York, 26 Oct 1962 (take 5), again without the opening harmonica solo but with different lyrics from Take B, from a 1962 Columbia acetate that surfaced in Apr 1982, now released in a probably slightly different mono mix on the Sony Music Europe 4CD set The 50th Anniversary Collection, 2012. R-0574 Third alternate take to the original single, with an opening harmonica solo but with different lyrics from R-0007, recorded at Columbia Studios, New York, 14 Nov 1962 (probably take 11), from a second 1962 Columbia acetate that surfaced in Jun 1984. Both songs were copyrighted separately by Dwarf Music in 1978, but are really part of the same work-in-progress, and the titles are used misleadingly. The song identified as I Can't Leave Her Behind on the bonus disc with the DVD release of Martin Scorsese's 2005 documentary "No Direction Home: Bob Dylan" (see VHS & DVD 2000s Part 3) is actually the song copyrighted as On A Rainy Afternoon! I previously reported that One Of Us Must Know (Sooner Or Later) on the UK release of Bob Dylan's Greatest Hits was an unfaded stereo version. However, it now appears that this is incorrect and R-0537 has been removed from the Rarities list. Thanks to Roger Ford for information that this take is now on both the 6CD and 18CD versions of The Bootleg Series Vol. 12 - Bob Dylan 1965-1966 The Cutting Edge released in Nov 2015 (6CD version - CD1, track 14; 18CD version - CD1, track 10), so is now no longer a rarity.